In 1801, Hayling Island had a population of 578 supporting fishing and farming which were the main industries on the Island. Adequate water supply to support the population was available from numerous wells on the Island. In 1824, William Padwick (Jnr) purchased the Manor House from the Dukes of Norfolk and with it the title of Lord of the Manor. In the same year, the toll bridge connection to the mainland at Langstone was completed creating the first fixed link to the Island (previously it was possible to use the Ancient Wadeway, between Langstone High street and Hayling island, but this could only be used at low tide). With the road bridge in place, an attempt to create a tourist resort was made and this resulted in the building of the Royal Hotel and Norfolk Crescent on the seafront in 1826. Further expansion of this venture met with local opposition and proved to be unsuccessful. Anticipating the arrival of the railway on Hayling in 1867, a racecourse was built with the grandstand next to the Royal Hotel. It was intended that the racecourse would hold its opening event to coincide with the opening of the Hayling Railway. Francis Fuller was both a Director of the Hayling Island Railway Company and also the promoter of the racecourse. Unfortunately the railway failed its inspection by the Railway Inspectorate and therefore its opening was delayed. The racecourse did not prove popular with the residents and it eventually closed. What emerged from the above was a population that grew with visitors to the island in the summer months and fell back to mainly residents only in the winter. To cope with the peak demands, piped water was supplied to South Hayling from 1895 by the South Hayling Water Company. The source being a well at Stoke. 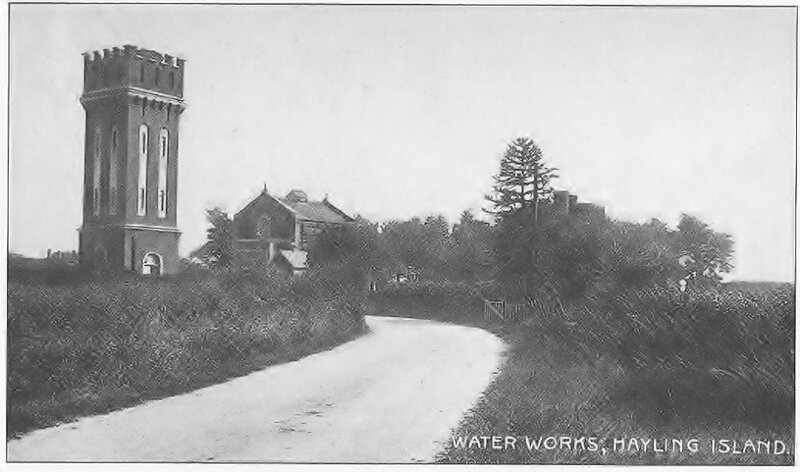 In 1898, the whole of Hayling Island was supplied from this pumping station. With demand for water in the summer months further increased due to tourism, the wells were found to be inadequate. Portsmouth Water piped water to the island in 1928 which was measured in a brick built Venturi House. This building still exists today and is located opposite the Ship Inn at Langstone.